Hey, guys! Meg, here. Hope you don’t mind me stepping in like this—I know I’m not your usual Supergirl Couch Club representative. I guess you could say I’m a tourist in National City this season, but I’m really excited to be here... Even though it looks like I’ve picked a pretty rough time to drop by. I mean, we’re jumping right into one seriously bummed out Girl of Steel this time around, aren’t we? Though, really, who could blame her? 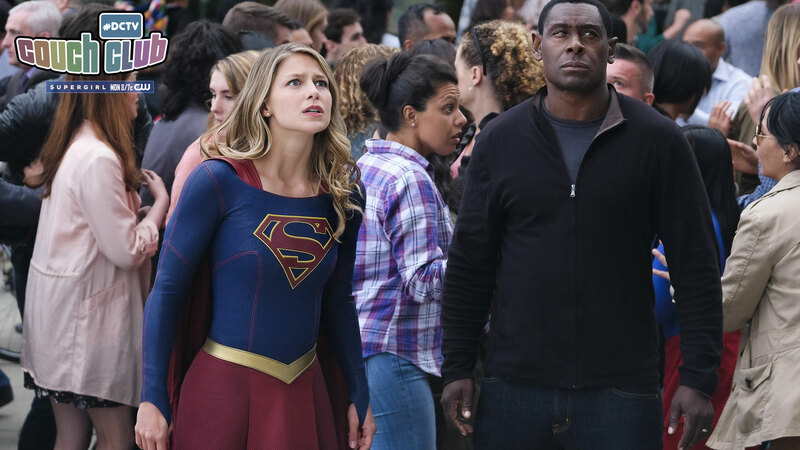 Kara’s been pretty thoroughly put through the ringer and it’s not like people write self-help books about what to do when your boyfriend leaves the planet through a wormhole after such catastrophes as a full-scale alien invasion of your home city or a brutal fight with your drugged-and-hypnotized cousin. You know what I mean. Things haven’t exactly been smooth sailing. But I’m going to be honest: I kind of love that we’re getting to really dig into this side of Kara now. I love the hope and the optimism of Supergirl as much as the next person, but I’m all for some good old-fashioned existential crises every now and again. Especially when dealing with Kryptonians. The thing about heroes like Supergirl and Superman is that they’re so powerful and so universal, it can get tricky to put them into situations that don’t just feel like minor inconveniences. That’s just the price you pay for having the powers to, essentially, literally do anything. But put them up against something emotional in nature? Something that can’t be hit or raced or melted away with laser vision? Well, that changes things. So we’ve got a Kara who, quite literally, would rather just not be Kara anymore. She’s found herself at a point where it’s easier to be the proverbial mask rather than the person wearing it—which, I know that’s obviously not a great way to cope with grief and anxiety, but I’m going to continue being honest here: I totally get it. There’s always that point after big changes, good or bad, that we have to sit down and think about what our next move is, and those next moves are sometimes just insurmountably awful. In Kara’s case, her next move means acknowledging that Mon-El is gone, and she’s been given all the closure she’s likely going to get... So of course it would seem like being anyone other than Kara is the easier and less painful choice. I don’t have a super heroic alter ego and I’ve found myself at that exact same point more times than I can really count. It’s half “the grass is always greener” and half “please just get me out of here” survival instinct. Of course, Kara’s problems are made trickier by...well, everything. National City is in a bit of a quandary right now and its most powerful people are making some pretty serious moves. This, of course, includes Lena Luthor who is finding herself up against Morgan Edge, who is...well, I don’t think it’s too out of line to just call him straight-up gross. Ready for a little bit of comics background? In the books, Edge (left) is actually the leader of Intergang, a name you might recognize from last season—or you might not. They didn’t have a particularly starring role or anything. In the comics, however, Intergang is one of Superman’s most persistent enemy groups, a cabal of corporate criminals who use alien technology for financial gain. Comics Edge has all sorts of nefarious connections, both on earth and beyond, making him quite the force to be reckoned with. Now, it’s obviously way too soon to call just how much this incarnation of Edge is going to borrow from his two-dimensional counterpart, but I don’t think it’s much of a stretch to think that Kara’s not done dealing with him yet. Stranded out in the ocean on a shipping freighter is definitely a pretty big inconvenience, but he’s certainly not off the playing field for good. And while I’m on the subject of newcomers...what’s up with this little girl Ruby and her mom? I know parents are supposed to be able to get all sorts of adrenaline-based strength powers when their kids are put in danger, but literally crushing steel with her bare hands? That...can’t be normal, can it? My only hope is that whatever is going on with every crazy thing happening right now, it all hits the pause button for long enough so that Alex and Maggie can have a nice, uninterrupted wedding. I don’t feel like that’s too much to ask, all things considered. I’m really looking forward to bawling my eyes out as J’onn walks Alex down the aisle. I almost didn’t make it through her asking him. Supergirl is a show with no shortage of good ships (am I alone in thinking Kara and Lena would make a great couple? Mon-El, who?) Alex and Maggie are definitely my favorite. I just want them to be happy. But I digress. The real issue we should be focusing on here is probably whatever is happening in Kara’s dreams. Are they even dreams? Or are they visions? And if they’re visions...what do they mean? Let’s talk theories in the comments below. I want to know what you guys think because I genuinely don’t even have a guess on this one. Guest writer Meg Downey covers DC's Legends of Tomorrow as a part of the #DCTV Couch Club. Look for Meg on Twitter at @rustypolished. Supergirl airs Mondays at 8 p.m. (7 p.m. CST) on The CW.